Yesterday something was said to me that made me pause and think. I’ve written on my blog before about the super nice man Ben that works the coffee counter at the Wawa. As previously stated, he always makes my morning with his chipper attitude. In all of the years that I’ve known him, I’ve never heard the man say anything negative. He’s my ray of sunshine every single morning, and yesterday I thanked him for always starting my day off right. Besides thanking him, I asked him how it is that he is just so happy everyday. His response: “It comes naturally. 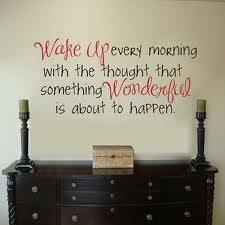 Every morning when I wake up and put my feet on the floor, I say aloud “Something wonderful is going to happen today! Even if it doesn’t pan out that way, it gives me something to look forward to!” He made me smile a little bigger than I do most mornings, and on my merry way I went. I have been thinking about those words since he said them to me, and quite honestly I fell in love with that sentence. What a great and positive way to start the day! I can admit that most mornings when my alarm goes off, I open my eyes, hit the snooze button, and lay there half awake making a mental inventory of the million tasks I have ahead of me. Since it’s 4:30am, I am less than excited about the million things I have to do. I’ve never been a happy waker-upper. Ever. Well today I gave it a shot. My alarm went off at 4:30, and after I groggily hit the snooze button I said to myself, “Something wonderful is going to happen today!”. I have to admit, that sentence was like a magic elixir. It was impossible not to smile after I said it. Even I, who gets out of bed in half a coma everyday, felt instantly refreshed. Those seven little words are better than coffee because it makes you feel a positive anticipation for the day. I actually felt like I was looking forward to something. What, I didn’t know…but I felt like it would be something wonderful. Now, did something wonderful actually happen to me today? Not necessarily. Sure, it was a good day, but I don’t know if I would classify any part of it as actually being “wonderful”. I felt pretty wonderful though…and I attribute it to the fact that I had the anticipation of something wonderful happening. In retrospect, that “something wonderful” actually happened to me yesterday and carried on through to today. Ben said a little something to me that made me think…and changed my outlook. Who knew my usual morning pit-stop could be such a game changer? Ben makes a mean pot of coffee and doles out some fantastic wisdom to boot. I consider myself lucky to have him as part of my morning routine. Do me a favor. Tomorrow morning try it out. Just say “Something wonderful is going to happen today.” to yourself when you are getting out of bed. It’s one simple sentence that can change your whole outlook. I’m telling you…it’s better than coffee…unless you’re getting your coffee from Ben. I don’t know too many things that are better than that.